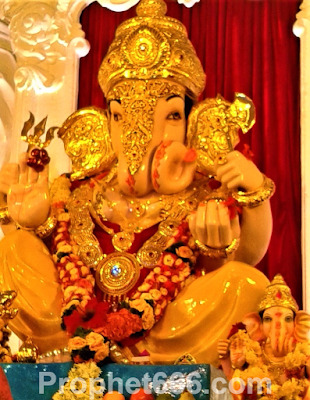 As per traditional Indian Jyotish Shastra and numerology the number 3 has been attributed to Lord Ganesha. Some interesting facts about this number are given below. 21 Durvas are offered to Ganesha. Naivedya of 21 Modak is offered to Ganesha. 21 Parikrama are done around a Ganesh Murti. Normally 21 Aavartan of any Ganesh Stotra are recommended or performed. Out of the 21 Lokas or Place of Existence like Prithvi Loka, Indra Loka or Surya Loka, the 21st Loka, which is the Swaanand Loka is the preferred Loka of Ganesha. 3 Stages of Existence of anything, including the Universe- Creation, Protection or Survival and Annihilation or Destruction. Apart from the examples given above, there are numerous other relevant pointers regarding the importance of number 3 in our day-to day lives. I will try to post some more facts in the near future. Main bahut dino se ek sawal puchhna chah raha Hoon...joki Aaj puchh raha hoon..
Sir Maine suna Hai ki BAJRANG BAAN adhikansh sites yafir adhikansh publications ke books me galat sahi shabdo ka prayog kiya Gaya Hai...aur sahi BAJRANG BAAN bahut mushkil se milta Hai..
Sir Meri Dil ki ichha Hai ki main sahi BAJRANG BAAN ka Path karoon..Kya aap Meri help karenge? Mujhe BAJRANG BAAN dene ki kripa karenge? 1975 का अंक "श्री हनुमान अंक "नाम से प्रकाशित हुआ था,जिसमे पृष्ठ 512 पर 'अद्‍भुत चमत्कारी बजरंग बाण'पूजा पद्धति के साथ है .गीता प्रेस की 'सुंदरकांड' के कुछ सन्स्करणो मे बजरंग बाण भी शामिल है . Gita Press ke book stall par main Gaya Tha...unhone bataya ki BAJRANG BAAN ke name se koi book nahi aati h Gita Press Mee...Haan Hanuman Chalisha aati hai..
बजरंगबाण एक पेज का है,सो अलग से नही छपा है. सुंदर कांड के कुछ सन्स्करणो मे यह भी साथ मे दिया है.दुकान से वह सुंदरकांड मांगिए जिसके अंत मे बजरंगबाण छपा है. Dear Sir, I would like to ask one question if you don't mind. My Question is HOW CAN I KNOW WHO IS MY ISHTA DEVATA ?? Please explain me if you have time, thank you so much and appreciate your help.